Simscape™ Electrical™ (formerly SimPowerSystems™ and SimElectronics®) provides component libraries for modeling and simulating electronic, mechatronic, and electrical power systems. It includes models of semiconductors, motors, and components for applications such as electromechanical actuation, smart grids, and renewable energy systems. 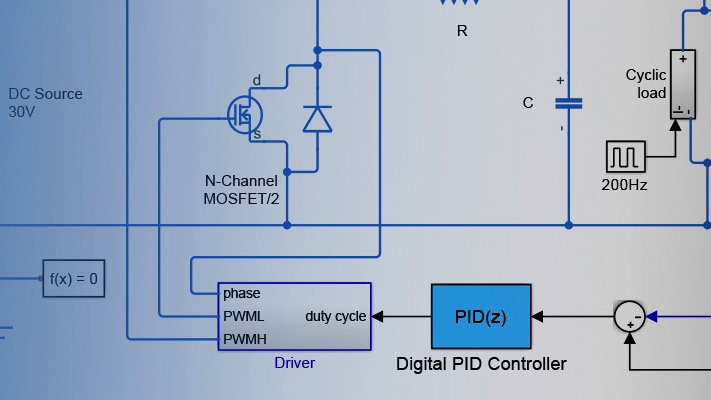 You can use these components to evaluate analog circuit architectures,​ develop mechatronic systems with electric drives,​ and analyze the generation,​ conversion,​ transmission,​ and consumption of electrical power at the grid level. Simscape Electrical helps you develop control systems and test system-level performance. You can parameterize your models using MATLAB® variables and expressions,​ and design control systems for electrical systems in Simulink®. You can integrate mechanical,​ hydraulic,​ thermal,​ and other physical systems into your model using components from the Simscape family of products. To deploy models to other simulation environments,​ including hardware-in-the-loop (HIL) systems,​ Simscape Electrical supports C-code generation.